Mount your DSLR, mirrorless, cine, or ENG camera using this complete CX2 Head and 75 Sprinter II Carbon Fiber Tripod with Ground Spreader and Case system from Miller for your studio or field video production. The system includes a CX2 fluid head, a fixed-length pan handle, a 75 Sprinter II carbon fiber tripod, a ground spreader, and a soft carry case. The CX2 fluid head features counterbalance settings, a side-load plate, and a maximum payload of 17.6 lb. 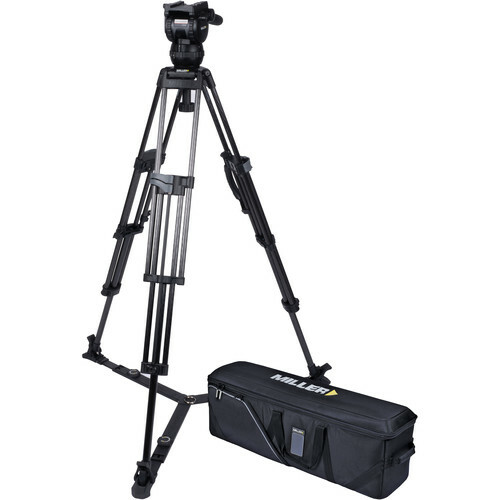 The 75 Sprinter II carbon fiber tripod supports a maximum payload of up to 66.1 lb, features a 75mm bowl head and spiked feet, supports a ground spreader, and has a built-in carry handle. Read more below about the items in this kit.